When we started Beaux-Arts in 2002 it was to fill a need in the marketplace for decorative solutions to modern intrusions. One of our first solutions was a decorative grille to camouflage the unattractive industrial flood ports which were required for the waterfront home we were building. Since then we have developed our latest product, a decorative foundation crawl space vent cover; which is available in two styles for $199. This foundation crawl space vent cover is made exclusively for foundations and crawl spaces to fit the typical 16″ x 8″ missing concrete block crawl space vent opening. There is really nothing in the marketplace that compares to the design and functionality of this product. Here are some images I found online for industrial options for foundation crawl space vent covers. Depending on your geographic location the crawl space should be sealed off in the winter (notice the image with just a metal plate), and opened in the warm months to allow ventilation. Our foundation vent consists of two separate parts. The frame which is attached to the foundation and the grille which is removable. Both are cast from an exterior grade urethane resin that won’t rot, rust, corrode or grow mold. The decorative grille can be removed by unscrewing four knurled knobs in order to insert a sealing plate for cold weather or remove the plate and add the fiberglass screen mesh for warm weather. Each grille provides 73 square inches of ventilation when the fiberglass screen mesh is installed. All installation hardware, the sealer plate and fiberglass screen mesh are included. These foundation vents are easy to install in new construction and existing structures as well, plus they are virtually maintenance free. 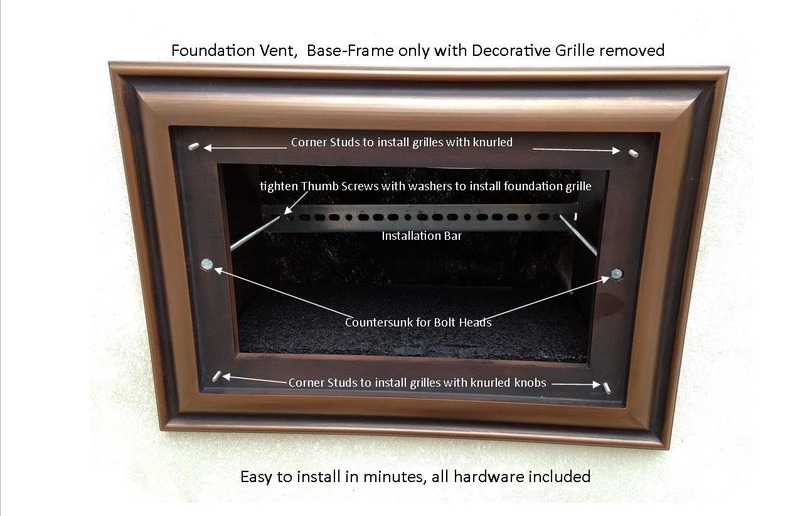 They are the best looking and functional solution to unattractive industrial foundation vent covers.